Poly Chlorinated Biphenyls (PCBs) are dielectric liquids which have been widely used in various industries for more than 50 years because of their supposed nonflammabi 1 i ty and thei r chemical inertness. Recent acc idents all over the world have shown PCBs can burn and their combustion by- products (dioxines, furanes, etc.) are highly toxic. In fact, confusion has been created in the pub 1 ie mind between the dangers and hazards induced by PCBs themselves and those generated by their byproducts. Meanwhile, PCB pollution and toxicity is a major concern for regulating agencies, such as EPA in the United States and industry. Most Western countries now ban PCB production and strictly control their use. However, enormous amounts of PCB remain in use and their safe handling, destruction and replacement are heavy burdens for industrial users. PCB pollution and its side effects are the subject of various studies with recent conferences devoted to these PCB studies. Thus a large body of specialized information now exists on the environmental, medical, bio- logical and safety aspects of PCB handling, use, cleaning and decontami- nation. However, no single comprehensive publication is yet available which deals with all the problems associated with PCBs. 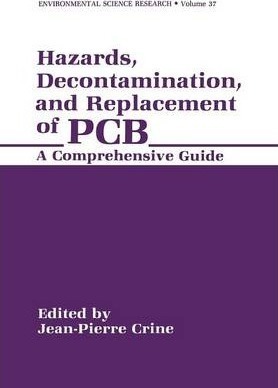 The major objective of the present book is to provide such a guide for PCB users. One interest of this book is that it brings together the point of view of scientists from widely different backgrounds: biologists, physicians, environmentalists, toxicologists, chemists, electrical engineers, etc. Illustrations note VIII, 232 p.
Basic Properties and Analytical Techniques.- Polychlorinated Biphenyls (PCBs) Physical and Chemical Property Data.- Gas Chromatographic Analysis of PCBs.- Human Health Hazards.- Polychlorinated Biphenyls-Human Health Effects.- An Estimation of the Actual Health Risk of Firemen and Workers Assigned to the Decontamination Following a Fire Involving PCB (Askarel and Contaminated Oil).- Environmental Effects.- Bioaccumulation of Polychlorinated Biphenyls in Canadian Wildlife.- Development of Decontamination Guidelines for PCB/PCDF & PCDD Decontamination in Areas of High Exposure Potential.- Decontamination and Retrofilling.- State-of-the-Art Technology for PCB Decontamination of Concrete.- The Retrofill and Reclassification of Polychlorinated Biphenyl Transformers.- Destruction.- PCB Destruction.- Combustion by Products and Replacement Liquids.- Products of Pyrolysis and Combustion of Liquid PCB Substitutes.- A critical Review of Selection Criteria for PCB Replacement Liquids in Power Apparatus.- Contributors.